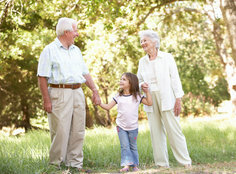 Many grandparents who are financially stable love the idea of making gifts to their grandchildren. However, they are usually not aware of the myriad of issues that surround what they may consider to be a simple gift. If you are considering making a significant gift to a grandchild, you should consult with a qualified attorney to guide you through the legal and tax issues that are involved in making such gifts. Making a Lifetime Gift or a Bequest: Before making a gift, you should consider whether you want to make the gift during your lifetime or leave the gift in your will. If you make the gift as a bequest in your will, you will not experience the joy of seeing your grandchild’s appreciation and use of the gift. However, there’s always the possibility that you will need the money to live on during your lifetime and in reality, once a gift is made, it cannot be taken back. Also, if you anticipate needing Medicaid or other government programs to pay for a nursing home or other benefits at some point in your life, any gifts you make in the prior five years can be considered as part of your assets when determining your eligibility. You could consider making a gift under the Uniform Gift to Minors Act (UGMA) or the Uniform Transfer to Minors Act (UTMA), depending on which state you live in. The accounts are easy to open, but once the grandchild reaches the age of majority, he or she will have unfettered access to the funds. You could also consider depositing money into a 529 plan, which is specifically designed for education purposes. Finally, you could consider establishing a trust with an estate planning attorney, which can be more expensive to set up, but can be customized to fit your needs. These trusts can provide wonderful spendthrift, creditor and divorce protection while allowing for more control over how the money is spent. You can have a conservative or liberal trust that can choose to provide for certain expenditures, such as their education, healthcare expenses or purchase of a first home. Tax Consequences: If you have a large estate, giving gifts to grandchildren may be a great way to get money out of your estate in order to reduce your future estate tax liability. In 2012, a single person can pass $5 million at death free of estate tax or gift tax, and a couple can pass a combined $10 million without paying estate taxes. In addition, a person can give $13,000 in 2012 to any number of individuals without incurring any gift taxes. A grandparent with 10 grandchildren could give $130,000 per year to all grandchildren (and a married couple could give $260,000), thereby removing that property from his or her estate. This is the time to consider gifting with the expiration of the $5 million gift tax exemption on December 31, 2012. Call us at (281) 277-3326 to schedule a consultation to discuss your gifting options.